I decided to introduce you all to my kitty, Alias. His name is Alias because all my friends called him something different. One person liked 'Dante,' another liked 'Kitty,' and I wanted to name him 'Cairo.' Long story short, he didn't know his name so we started calling him Alias. And He uses the toilet and honestly, he misses less than I do. In the 4 years and a half I have had him, he only has had one accident. I didn't teach him to flush though, because he used to like to watch the water swirl. I was afraid he would sit there and flush, flush, flush, haha. He has the coolest personality. He is one of the only breeds of cat that I am not allergic to. I am honestly not too much of a cat person, but he follows me everywhere and cries if I am home but leave him by himself in another room. 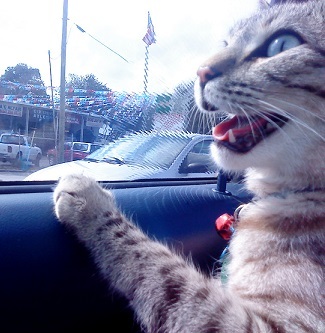 He sits on the seat of a car with the window open and looks at all the cars/pedestrians. I saw a segment on Pet Star about a cat that could be trained to do tricks, so I taught him to sit, and my personal favorite is when I say "up." He will get on his hind legs and beg for a treat. And I believe he is an F4? or Maybe an F5? I wasn't really paying attention when I adopted him, and his paperwork is here somewhere . . . Well, I just wanted a companion kitty. And he is a great companion for the fox. He is so calm and loves all other animals. He travels well being able to use the potty and loves my mom's Great Dane. The only time I have an issue is if I walk him on a leash, or bring him to the pet store and a dog starts growling at him. I took the picture of him in the cart today on the way to go to the pet store to get fitted for a harness, and he was totally calm except for when this mini poodle started growling at him. He cried for me, then sat on my shoulder until the mean dog left. He is such a big baby. After the vicious poodle left (and I swear all small dogs have that Napoleon complex), he sat calmly on the floor on his leash while I fitted him for a harness. I never thought I would have a pet cat, but now I can't imagine my life without him.